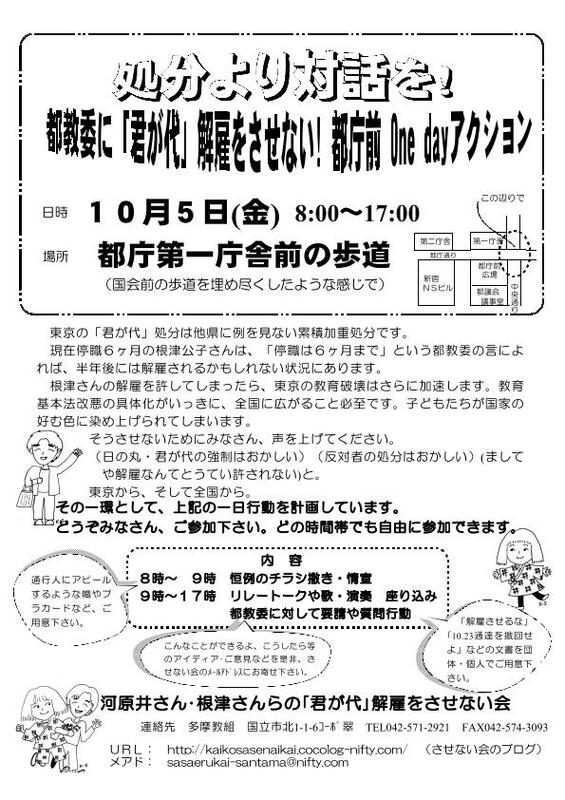 Copyright (C) 2007-2019 河原井さん根津さんらの「君が代」解雇をさせない会. All Rights Reserved. 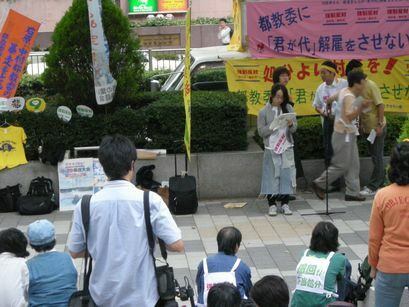 From next spring to the year after next, the crisis of discharge of women teachers approaches only for the reason that they repeated non-rising at the time of national anthem unison. 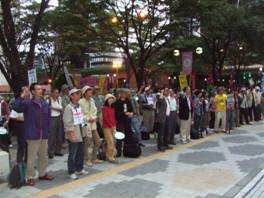 Therefore, our protest rally was held daylong in front of the Tokyo Metropolitan Government Office on October 5 of the World Teacher’s Day. 400 people gathered from the whole country. 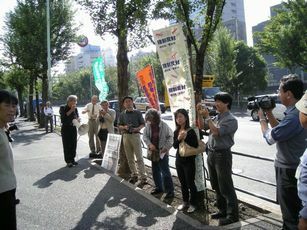 A note of protest urging their disposal withdrawal was handed from the teacher representatives to the Tokyo Board of Education. The message of the solidarity, resolution and letter of request to the capital Board of Education were sent to us in cooperation with victims by the teachers, former teachers of USA, France and Canada. 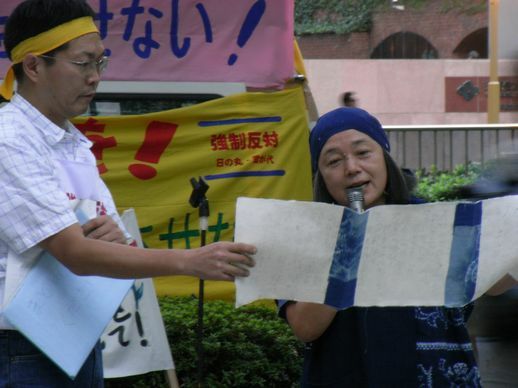 In San Francisco, Los Angeles, a note of protest was handed to Japanese Consulate by American teachers. 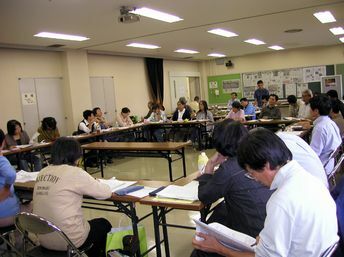 There is a recommendation concerning the status of the teachers that ILO /UNESCO gave in 1966. 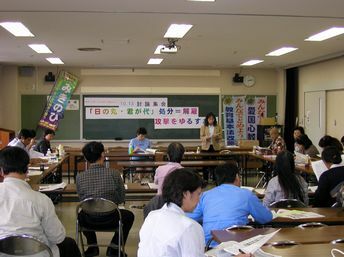 As for the intense disciplinary measure to the women teachers, the civil liberties of the teacher are lost, and it is thought that this case is against above recommendation. 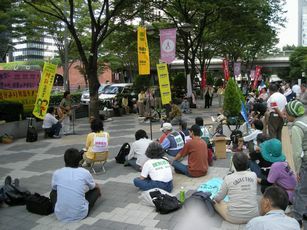 It is said, in ILO treaty, that the governor must not inflict forced labor to the people by the reason of their expression of political opinion. In addition, ILO prohibits discrimination of the service by the reason of opinion of religion / the politics. 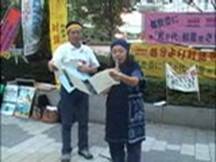 Compulsion of the rising at the time of the national anthem unison and disposal/discharge to the person of non-rising is problem that violates ILO treaty, and is serious. 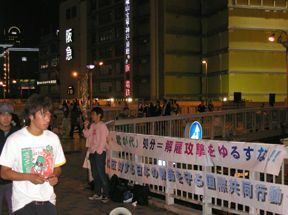 The following photographs are the photographs which we pictured on the World Teacher’s Day. 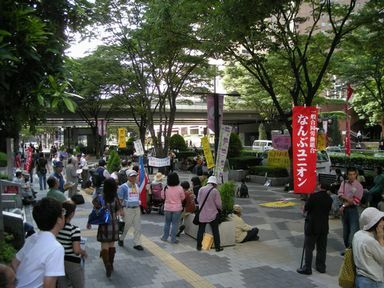 Toward the Board of Education in the Tokyo Metropolitan Government Office, teachers are raising voices of the protest.